Long-term declines in the overwintering Eastern population of North American monarch butterflies are significantly increasing their likelihood of becoming extinct over the next two decades, according to Scripps Institution of Oceanography at UC San Diego and U.S. Geological Survey research published on March 21, 2016. The new study, available in the journal Scientific Reports, found that the Eastern migratory monarch population declined by 84 percent from the winter of 1996-1997 to the winter of 2014-2015. Using this information, the study demonstrated that there is a substantial chance – 11 to 57 percent – of quasi-extinction over the next 20 years. A quasi-extinct population is one with so few remaining individuals left that recovery is impossible. While the remaining individuals may survive for a short time, the population as a whole will inevitably go extinct. "Because monarch numbers vary dramatically from year to year depending on weather and other factors, increasing the average population size is the single-most important way to provide these iconic butterflies with a much-needed buffer against extinction," said Brice Semmens, the lead author of the study and a scientist at Scripps. Semmens said that as an example of this variability, just after the analysis concluded, the World Wildlife Fund Mexico and partners reported a large increase in monarch numbers since last year. However, this increase was followed by a recent winter storm that may have adversely affected the population. The authors emphasized that although one good winter – as occurred this year – is positive news, higher average monarch numbers are necessary for reducing the long-term risk of quasi-extinction. Because counting individual monarchs is challenging, scientists measure population size based on the geographic area that their colonies cover while spending the winter in Mexico. The United States, Mexico and Canada aim to increase the number of Eastern monarchs wintering in Mexico so that they occupy about six hectares, or about 15 acres, by 2020. This year’s population size increased substantially to about four hectares, or close to 10 acres. The population was 1.13 hectares (about 2.8 acres) during the winter of 2014-2015, and at its lowest, 0.67 hectares (about 1.7 acres) during the 2013-2014 winter. The Scripps and USGS scientists found that if the Eastern population reaches the six-hectare goal announced in last year’s national pollinator strategy, the quasi-extinction risk over 20 years would decrease by more than half. Scripps and the USGS collaborated with scientists from the University of Arizona, Iowa State University, University of Minnesota and the University of Kansas on the study. The research was conducted as part of the Monarch Conservation Science Partnership, a team of scientists and resource managers working together to help inform the management of monarch butterflies. The partnership was hosted by the USGS Powell Center for Analysis and Synthesis in Fort Collins, Colorado. Reasons for monarch population declines are complex, although some evidence suggests that loss of breeding habitat is the primary factor. Other factors include adverse weather conditions in recent years, loss of overwintering habitat, disease and exposure to contaminants. There are two main populations of monarch butterflies in North America: the Western, which winters and migrates west of the Rocky Mountains, and the more abundant Eastern population, which is the subject of the new study and ranges east of the Rockies from central Mexico to southern Canada. 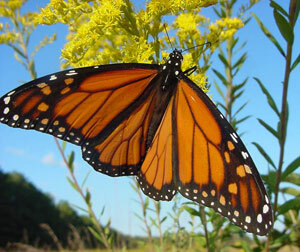 Eastern monarchs breed in the United States and Canada, and migrate to Mexico for the winter. Western monarchs migrate inland north and east from colonies along the California coast to states ranging from Washington to Arizona.? The U.S. Fish and Wildlife Service is considering a petition to protect monarchs under the Endangered Species Act.